One of the key factors to succeeding in football betting and make sustained profits is to have a concrete staking strategy in place. Yet it is one area that the majority of casual gamblers neglect, largely due to the serious discipline it requires, and a more cavalier approach to football gambling can sometimes feel more exciting. 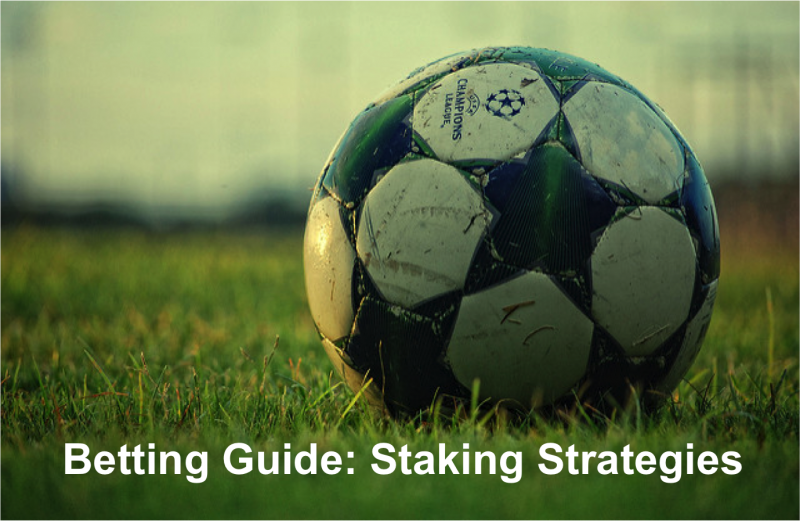 In this guide we will look at the importance of using a staking strategy, explaining some of the terminology that is commonly used when discussing these strategies, and looking at some of the most popular staking strategies around today, along with their strengths and weaknesses. It may seem very formal and business like to have a set staking strategy to stick too when betting but if you treat your football betting as a serious business then it has every chance of succeeding! Why Do You Need A Staking Plan? There is an old saying in the Army that goes 'Fail to prepare, prepare to fail'. This quote accurately sums up the importance of setting a staking plan to follow, as it prepares you for any outcome in terms of your bankroll and implements a strategy to help maximise profit and minimise the risk in the long run. A staking strategy will also help develop a disciplined mind-set, especially if you gamble professionally or as a serious investment, and with so much to think about when placing a bet on football, to already know what your stake will be is one less thing to work out each time. One of the real dangers of football betting with no strategy in place is that your profit and overall bankroll can be put at risk with one bad bet. There are countless stories of people who bet all they had in their bookmaker's account on a 'sure thing', only to see it not go their way. Overnight, they have lost what might have taken them months to build up. The time to research and decide on which staking strategy to follow is the minute you opt to step into the world of football betting. Of course, if you have begun betting already without one this is not possible. In this case, just do it as soon as possible! As with most things in life that are not as exciting as others, it can be tempting to leave it as a job for another day. However, it's important to set some time aside to see which strategy will work best for you and find out exactly how to implement it on each bet, as it will look after your profit and bank balance from Day One! Not deviating from your staking strategy is equally as important as having one, as if you don't follow it, you essentially no longer have a staking strategy. Some will follow it now and then, some will follow it 80% of the time while some will never follow it in practice, but all will struggle as a consequence. The reason this is so key is twofold. Firstly, the staking plan works by giving you an edge in terms of asset protection that is simply not there if you don't stick to it 100% of the time. Secondly, you can almost guarantee that the times you don't stick to your plan, the bet will lose and all your profit will go with it. This could be a sum that has taken all month to build up and you do not want to see all your profit for that month go up in smoke in one bad bet! A key benefit to having a proper betting bank is that it makes it much easier to track your progress over time. Most gamblers will have a tendency to ignore their losses and over-play their wins in their own head. This naturally can lead to a skewed impression of how your results and betting system are working in the long-term. By having a separate betting bank, this is negated as it is clearly shown in black and white what money you have currently compared to what you started with. The betting bank you set up can be as large or small as you like – the amount in it is not important, merely the fact that you have one. It is another way to look after your money and also become serious about football betting if it is a business to you. Before we move onto a few different staking plans that are common in football betting, it is useful to explain the concept of using 'Points' as a strategy. You may have heard of this already but be unclear as to what exactly it is or how it works. Once you have set up your betting bank and deposited a certain amount, you then divide it into points. This is the number of bets that you want your betting bank to cover and is divided by the total amount in your betting bank. By doing this, you will know how much each point is worth and then be able to use this system when placing a bet. If it is a bet you feel is strong (such as Manchester United to beat Northwich Victoria at home in the FA Cup) then you may bet two points on it as opposed to just one point for a more regular bet. To give an example of how this points system works, imagine you have £1000 in your betting bank. You decide that it is sensible to cover 100 bets with it as this takes into account any losing streak or lost bets along the way. You divide £1000 by 100, which is £10. This makes £10 your betting amount per point. If you bet one point on a game, you are betting £10 where two points would be £20. There are many different staking plans out there to follow and in a lot of ways, the one to go for is a personal choice. Have a read through this guide, decide which one suits your individual gambling style and make sure you know exactly what you are doing when it comes time to place a football bet. As already touched on in our Definitive Guide to Football Betting, Fixed Amount Strategy is also known as 'Level Stakes', and is probably the simplest staking plan and as such one that a lot of beginners will start with as it gives a solid introduction to the world of staking plans. The strengths being that it is easy to follow, quick to work out when putting a bet on, and gives superb coverage against losing in terms of your betting bank. With this strategy, you decide on a fixed amount that you will put on each bet. Obviously, the exact amount will depend on how much is in your betting bank to start with. If you have £1000, it is simply not sensible to stake £200 on each bet! Many gamblers will go with a figure between 2% and 5% of their betting bank. So with a betting bank of £1000, you would bet between £20 and £50 on each bet depending on how aggressive a gambler you are, as this still gives you room to hit a few losses without being wiped out. The main downsides to this strategy is that it can become a bit rigid and dull for the more experienced gambler as well as taking longer than other strategies to build up your profits. This is probably the second most popular staking plan punters use and as a tipster, it's easy to see why. It is still pretty simple although a little more involved than the fixed amount strategy. It gives good protection to your betting bank and can build it up a bit faster than a fixed amount strategy in the long-term. To show how this works, let's take our betting bank of £1000 again as an example. In this strategy, we decide on a fixed percentage of the betting bank we will be happy to stake on each bet. When setting this, you need to make sure it is a level that does not leave you open to excess risk (i.e. 25%) but isn't too low to make the bet unappealing (i.e. 0.5%). A lot of punters go with a figure between 2% and 5%, which for our betting bank would be between £20 and £50. For this example we'll use 5% (£50). The real key difference to this strategy compared to the fixed betting plan above is that you re-calculate your percentage stake amount after each bet. So, if you decide 5% is the right level for you and put £50 on a 5.00 odds winner, you will then have £1200 on your betting bank. So for the next bet, you would work out 5% of £1200, which is £60, and use that as your stake. This constant re-calculation and betting of a larger stake as your bank grows explains why you can make profits at a faster rate in this system compared to the fixed staking plan. However if the first bet had lost, your betting bank would be £950, which would mean for the next bet, you would work out 5% of £950, which is £47.50, and use that as your stake. This smaller stake amount when the betting bank is lower than what you started with helps to protect your betting bank. However it also means recovering your losses will take longer. A solution to this issue, that some use, is to only calculate a new stake amount when your betting bank is more than what you started with. This is one of the more high-risk staking plans out there and so one that is only recommended for more experienced football gamblers. It also requires a large betting bank in the first place to cover the potentially large bets you might need to make. The idea behind the Martingale staking strategy is fairly simple. Each bet placed is at odds of 1/1 (2.00). If the bet wins then that's great – you bask in the warm glow of a job well done. If it loses however, the system kicks in. You would then find a new even money bet to take but this time you would double your original stake and keep doing this after every loss until you hit a winner. The theory goes that when you eventually hit a winner, as you surely would on even stakes after a period, you would recover all your losses and also make the profit expected from the original bet had that been a win. The initial stake amount is up to you, and will be influenced by your initial betting bank. One word of advice though – you can soon need quite a bit of cash to cover a bad run of losing bets so don't set it too high! As an example, imagine we take a bet on Juventus to win at 1/1 (2.00) odds with a £10 stake. Juventus lose and so we put another even money bet on Everton to beat Huddersfield at home. This time our stake is £20 but the Toffees let us down as well. Moving on we find an even money bet on Valencia to beat Malaga at home and put our newly doubled stake of £40 on. They do win and our return is £80, which leaves us £10 in profit, the same as if the first bet on Juventus had won. The real downside to this strategy is that it relies on you having an almost infinite betting bank and nerves of steel that can carry on covering numerous losses with increasingly large stakes while you wait for the winner to arrive. There are not many who can do this and so you can find yourself totally wiped out if your winning bet doesn't come when you need it too. In some ways this is quite similar to the above Martingale system in that it relies on increasing your stake after a losing bet to eventually finish in profit or at least recovering a large proportion of your losses when you hit a winner. Therefore an iron nerve is also required, as well as a large betting bank so you can keep covering the losing bets until you hit a winner, so it may not be for all football gamblers out there. The mechanics of the Fibonacci system is based upon a sequence of numbers where the following number is always the sum of the previous two numbers. As can be seen in the below sequence. This system as a result relies on the use of points as explained earlier in this article. You would begin by putting 1 point on your selection and then if this loses, putting 1 point on the next. If this were to lose also, the Fibonacci system kicks in. For the 3rd bet, you would add together the number of points for bet 1 and 2 (i.e. 1 point + 1 point) to get the point stake for the next bet, which would be 2 points. If you hit a winner on that 3rd bet then you simply start again with 1 point on the next bet. If, however, that 3rd bet doesn't come in then you carry on adding the point value of the previous two bets together to find how much to stake. So, for bet 4 we would add the 1 point from bet 2 and the 2 points from bet 3 to give us our bet 4 stake of 3 points. This continues until you find a winning bet. The advantage to this system is that, as with the Martingale plan, it relies on the mathematical fact that you will find a winner eventually and make some money as long as the winning odds aren't too short. If these winners come fairly regularly and at a good price then this plan can work well. The real problem with this system comes if you hit a long losing streak, as the amount of money you would need to stake per bet will rise sharply if you continue to lose. Of course, if you are confident in your betting selections this may not concern you. One of the lesser-known yet strongest staking strategies is the Kelly Criterion (or Proportional Betting) Formula. As the name suggests, this was invented by John Kelly who was a researcher at Bell Laboratories in 1956. Although a fairly aggressive staking plan, it does match up well to the other plans we have looked at and can rapidly expand your betting bank if followed correctly. The general idea behind it is that the stake you place on each bet should be proportional to the perceived edge you have. The Kelly Criterion Formula is a strategy used by investors as well as gamblers worldwide as it applies sound scientific principles to reaching your decision on how much to invest or stake on each selection. This has a distinct advantage of removing emotion from the decision around how much you should stake. Simply use the formula Kelly constructed and the mathematics involved will do the rest. b = the decimal odds of your bet minus 1.
p = your probability of winning expressed as a decimal number. As you can see, this is one for the person who enjoys numbers and crunching formulas! The first thing you need to do is to work out your personal betting edge to use in the formula. To formulate your edge, you need your strike rate and average decimal odds. The strike rate is simply the percentage figure of wins you had over a certain amount of bets and the average odds is the total odds you had for all those bets divided by the number of bets placed. To get your strike rate as a decimal you simply need to divide your strike rate by 100, the answer can then be multiplied by your average decimal odds -1 figure, as shown in our example below. Simply add Part One's figure and Part Two's figure together to get the decimal version of your percentage edge! Now you know how to calculate your edge, we can look at the Kelly Criterion Formula in action. Let's pretend we find a bet for Lyon to beat Monaco away at 3/1 (4.00). This gives us the b (decimal odds minus 1) portion of the formula, with a figure of 3.00, and also helps us work out p and q. The value of p (probability of winning) is worked out by adding your edge to the bookies probability of the bet winning. For example, at 3/1 the bookies believe the bet has a 25% chance of winning and a 75% chance of losing. If we add our previously calculated edge of 10% to the bookies probability of the bet winning (25%), we get 35%, which in decimal format is 0.35, which is the value for p (your probability of winning). Working out q is then the easy part, it's simply 1-p, which is 0.65. So, using the Kelly Formula we see it is recommended to use 13% of our betting bank on this particular selection. The main thing to be aware of with this system is that the suggested stake amount will sometimes be a lot higher than you would normally bet on one game. In the above example, 13% of your betting bank is a figure that even some seasoned gamblers would baulk at! This doesn't mean you can't use this staking plan though – a lot will simply do all the maths and then half or quarter the suggested stake amount. The other thing to note about this system is that it does rely on calculating your edge correctly and getting all the other calculations within the formula correct. If you aren't that strong on maths it may not be one for you, as doing the equation wrong will naturally give poor results. If you are thinking of putting any money into football betting, especially as a serious endeavour, then learning about staking strategies is vital. As this article has shown, it will protect your betting bank and help maximise profits along with giving you a structured plan to base your gambling exploits on. All professional gamblers will employ some form of staking plan and this just shows how crucial it is if you are serious about succeeding in the world of football betting. There are many different strategies out there as this article has shown, so choose the one that you understand and like best, and just make sure you stick with it!